Help Us Exceed Our 2019 Goal to Donate $30,000! Monarch Community Outreach (MCO) is a 501(c)(3) Non-Profit Organization associated with Monarch Mountain and its employees that provides aid and service to our community. People in need of the basic necessities of life due to unforeseen circumstances. I want you to know that we have ordered the Emergency Alert System and it is on the way. Because of the Monarch Community Outreach grant, and the article in the Mt. Mail, we were contacted by Linda Nyberg at Sangre de Cristo Electric who suggested we apply to their Operation Roundup program to help pay for the balance on the EAS. This morning Linda called to say they will grant the $1,260 needed to complete the order. On behalf of the Food Pantry at First Presbyterian Church I'd like to thank you for the generous donation. Our community continues to have need of even the very basics for so many. Our distribution of food increased by 30% in 2015 so this gift was very greatly needed and appreciated. Thank you so much for your generous donation!! We are so blessed to have donors like you that believe in our mission! Please know that we appreciate you. 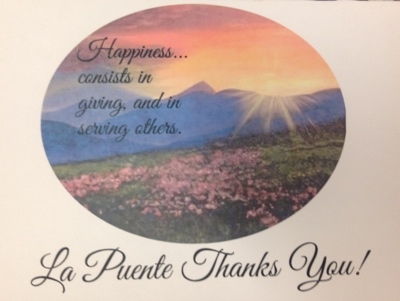 Sincerely, La Puente, Staff and Volunteers. Thank you so much for your donation of $500 to the Salida Circus Outreach Foundation, 501c3. Your contribution keeps the circus spirit alive in Chaffee County! Thank you for your gift of $1,000 to the Salida Pregnancy & Family Center! We appreciate your immense generosity so very much! As you know, the Center strives to help mothers, babies and families during a wonderful as well as often stressful time. You gift will enable us to meet their needs in many ways. The counseling we do and the classes our clients take can make a huge difference in the quality of family life in our area. The items they can earn for themselves and their babies add to the enjoyment of this special time. Thank you so much for choosing our application for you funds! We know there are many deserving non-profits in the area, and we are thrilled to have your donation of $1,000, which will help us kick off our conservation and exhibits fundraising drive. We invite all of you to check out the museum, especially if you haven't visited in several years. We have been busy remodeling, creating new exhibits and overall, aiming to improve the visitor experience. We'd be happy to give you a tour.